Western Avenue, Los Angeles (LA), USA. This area where Korean-language signs line the main street is part of “Korea Town,” formed since the 1960s. At night the street is treated as a bed by homeless people, many of them Koreans. Fr. 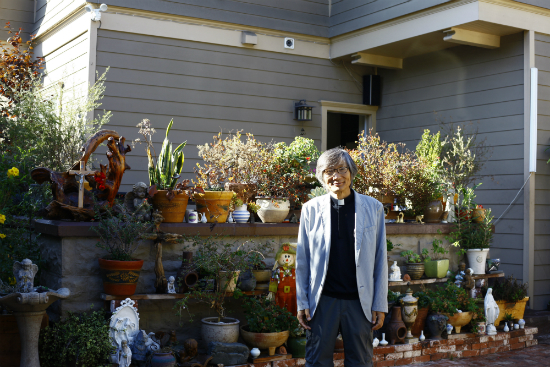 Kim Dong-jin (62, photo in front of Adullam Shelter) of St. James Church, in the Anglican Church Los Angeles Diocese, lives with 23 homeless Koreans. As an Anglican priest he is guaranteed a life of stability and honor, but he has chosen to live together with the homeless, sharing their joys and sorrows. Adullam Shelter, which he operates, is located at the southern end of Western Avenue. He rented a three-story house, divided the rooms and partitioned the living room to create individual living spaces. 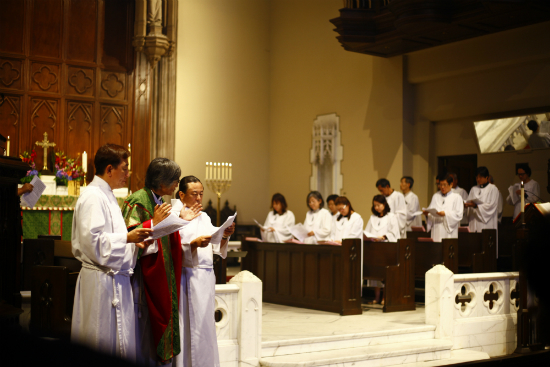 The kitchen and bathroom are used in common, and each Wednesday evening a worship service is held. The shelter accepts as “family” only persons age 65 or above who have been homeless for more than a week and who have no family to care for them. Its diverse residents include a sightless person, a person with an artificial leg, and a woman who shouts at every opportunity, “I’m going to sue the US government for turning my pretty face into an ugly face!” Also living here are a former president of a trade company that employed hundreds, and a former student council president at a prestigious university. Twenty-seven years has passed since Fr. Kim came to the USA. His nickname is “beggars' chief.” For 15 years, starting in 2000, he served ramyeon (instant noodles) to day laborers out in the streets looking for work. In 2009 he established the shelter with the thought of “no more Korean homeless people in the streets.” So far 110 people have lived there, 20 of whom later found employment and their own places to live. Each year at least one funeral takes place; and seven residents have become faithful members of the St. James Church choir (photo below). The Bible verse cherished by Fr. Kim is, “Truly I tell you, just as you did it to one of the least of these who are members of my family, you did it to me.” (Matthew 25:40). He maintains the shelter without help from the diocese, taking money out of his own pay and soliciting support from friends.